Half Moon Bay is located right on Pacific Coast Highway, about 45 minutes South of San Francisco. It is a beautiful town with a fantastic location on the coast and lots of fun activities and shops to keep you interested. 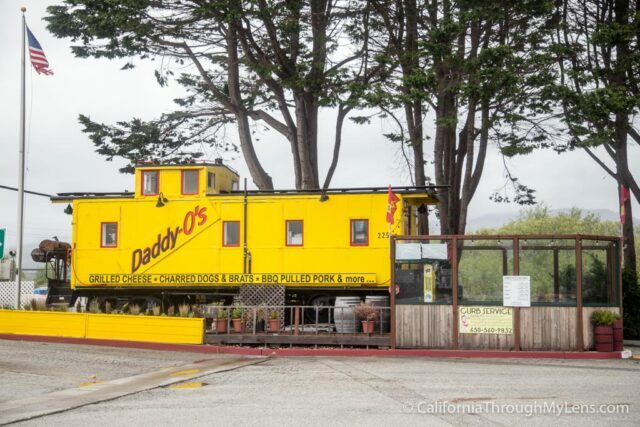 There are many great places to visit for food such as Via Uno, It’s Italia and Sam’s Chowders House, but for the unique stops consider this list of 12 shops/restaurants/museums that will help you make the most of your time in Half Moon Bay. 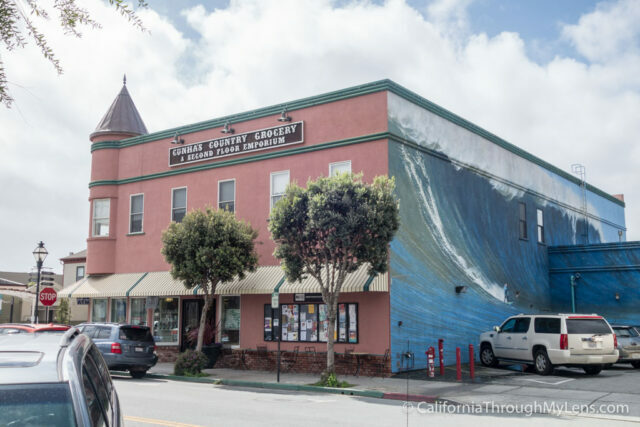 The main downtown stretch in Half Moon Bay, aptly called Main Street, only has a few blocks of shops, but a whole lot of charm. Of course, they have the traditional boutique clothing shops and restaurants but if you are looking for some of the unique places to check out consider the shops below. Nothing goes together like cheese and wine, so a shop that has a lot of both of them is an easy recommendation. 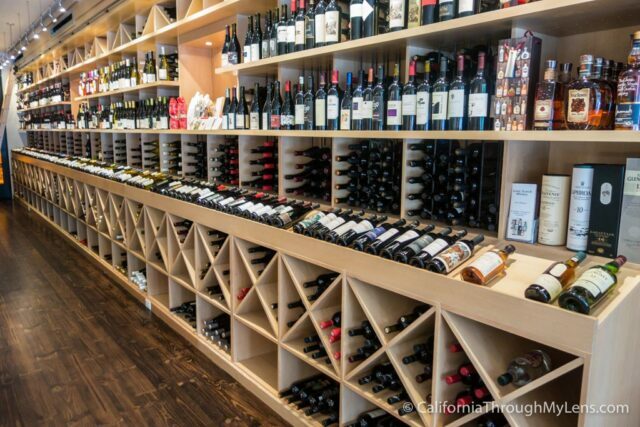 This small shop has a large selection of fresh cheeses in a cooled display and a row of fantastic wines that goes about 25 feet back into the store. It is a fun spot for trying both, with lots of different wine and cheese flights set up that you can purchase. 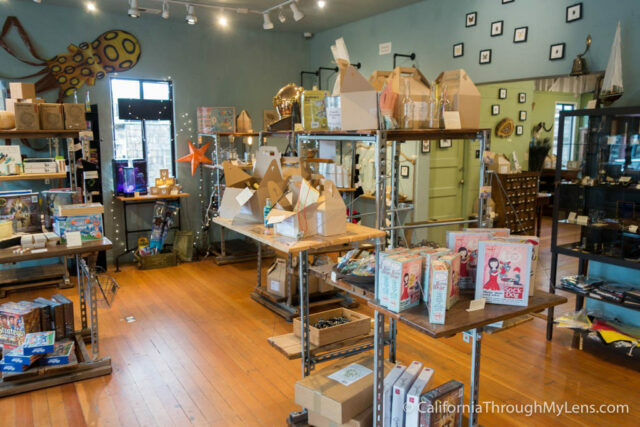 My favorite store in Half Moon Bay, Odyssey has a whole bunch of random things. The stores displays include fantastic items like marbles with real bugs in them, air plants made to look like jellyfish and even touch activated lights. Outside on the weekends, they also have a fun area of amusements that includes the world’s largest marble race, with the marbles being bowling balls and a sunken pirate ship. It’s a great place so explore in the city. If you are into cooking or kitchen accessories, then you should not skip Toque Blanche. This store has more kitchen items in a small space than I have ever seen. 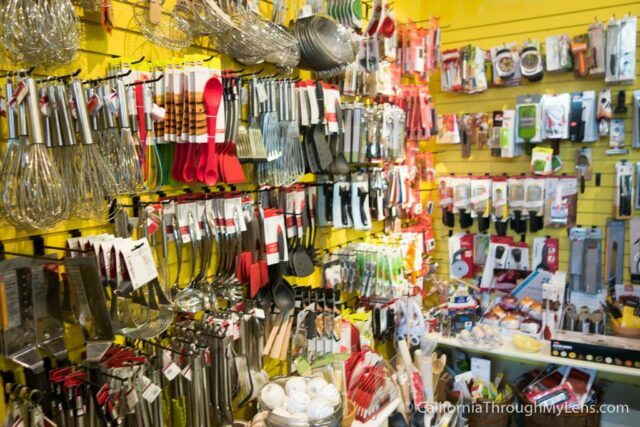 It was overwhelming, but I imagine if cooking is your thing then it would be an exciting store to shop. 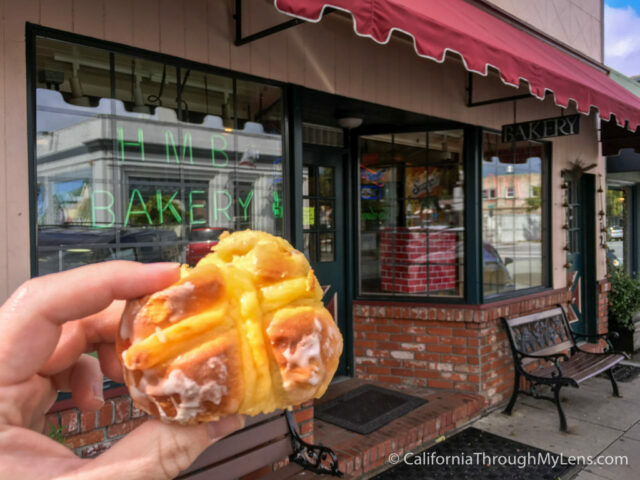 When you research what to see and eat in the area, you will no doubt come to recommendations for Hot Cross Buns at Half Moon Bay Bakery. These English inspired treats often sell out quickly and are worth a try for the current price of $.95. I wouldn’t say they were my favorite, but I know people that swear by them. 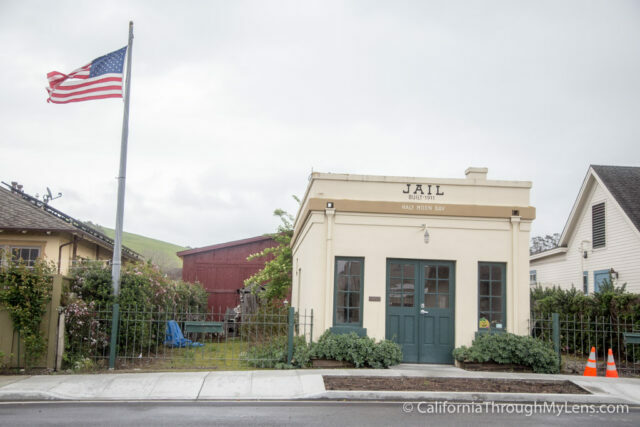 The old Half Moon Bay Jail (or Spanish Town as it was called back then) was built in 1911 and still stands today as a museum dedicated to the area’s history. It is a tiny little place but it is fun to see, and it is only a block off Main St. Located on Highway 92, the main drive that leads from Silicon Valley to Half Moon Bay, Spanish Town is a fun stop. 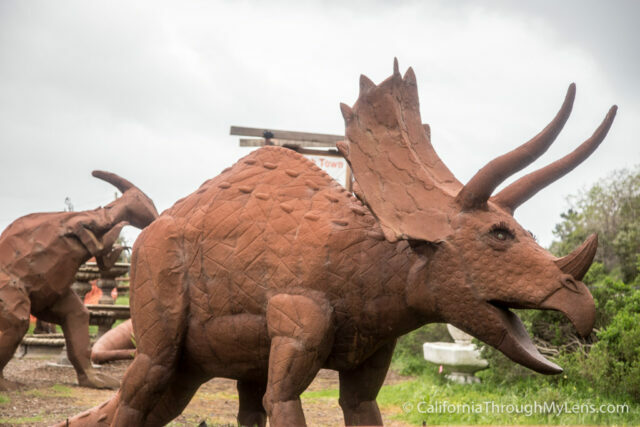 The store is an art gallery that sells mostly outdoor related items, but the main attractions are the massive metal dinosaurs that you can see from the road. It is a fun place to walk around and just imagine having these statues in your yard. One of my favorite things about Northern California is these small drive-thru coffee shops; they are sorely lacking in most of Southern California. 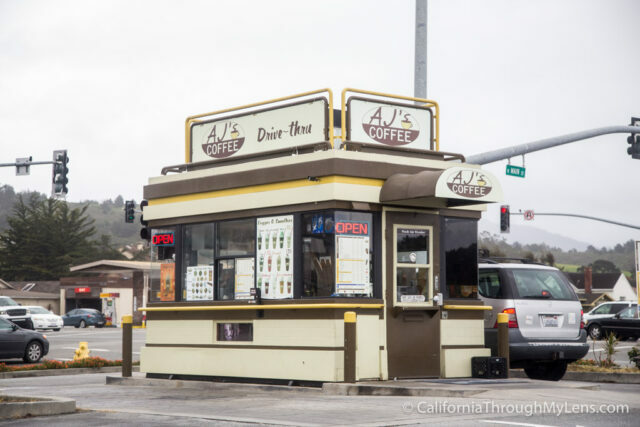 AJ’s is a quick stop for good coffee in the area. 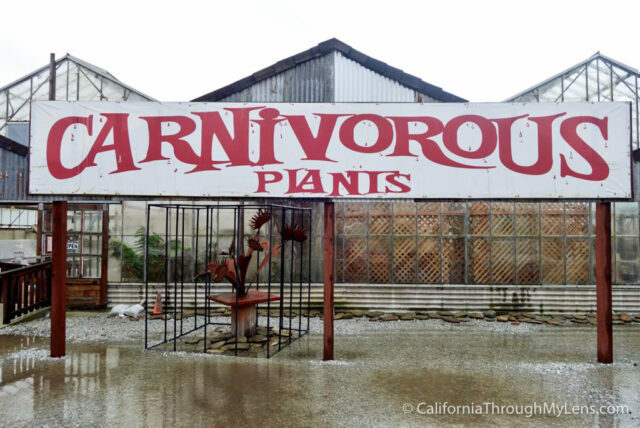 Also on Highway 92 like Spanish Town, how can you resist a visit to a store that has a massive carnivorous plants sign? I had to pull off the road to see it and was glad I did; the owner Phil was great to talk to, not to mention his shop was well laid out and had a lot of really unique plants. I wanted to take one home with me, but I was in the middle of a road trip so it wouldn’t last. It’s a neat shop even if you aren’t buying anything. Described as the “Disneyland of Pubs,” Cameron’s is a fun spot for a good pub meal or drink. The exterior is where it shines though with a full double decker bus sitting parked outside and an old English phone booth as well. What’s not to like about an eclectic spot like this? So there you have it, some of my favorite non-traditional stops in Half Moon Bay. 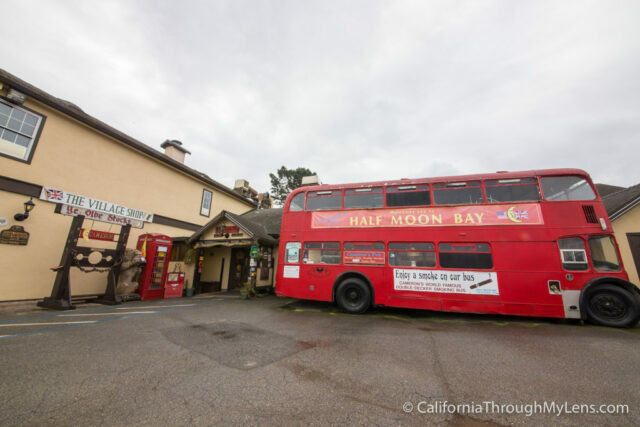 Check out Visit Half Moon Bay for more recommendations I am sure I left something off, so what would you add to this list? Let me know in the comments.